The St. John’s Red Storm continue to develop into one of the country’s most surprising teams as they beat Seton Hall today, 78-70. The Red Storm avenged a blowout loss to Seton Hall earlier this season and defended their side of the Hudson River with solid play from Marcus Lovett, Shamorie Ponds and Tariq Owens. The Red Storm were able to contain Pirates stars Angel Delgado and Khadeen Carrington for the bulk of the game and provided some Sportscenter-worthy highlights for the 9,027 fans in attendence. Owens stepped up his game bigly versus Delgado this afternoon. The Seton Hall center went for 21 points and 20 rebounds in the last meeting between the two teams. Owens wasn’t going to allow that again. He established his presence early with several blocks in the first few minutes of the ballgame. Lovett, coming off the bench as Chris Mullin’s sixth man provided the early offense as the Red Storm caught the Pirates flat-footed in getting second chance points. What set St. John’s apart today was their defense. Seton Hall looked flummoxed at times when getting into their set offense. The Red Storm took advantage of the Pirates hesitancy by jumping the passing lanes and causing 11 Seton Hall turnovers in the first half. Delgado had four turnovers in the first half, while shooting an uncharacteriscally 1-6 from the field. The lone bright spot was Desi Rodriguez who had 13 points at halftime. Lovett had 12 points after the opening stanza and the Red Storm took a 37-27 lead into the locker room. Whatever Pirates Coach Kevin Willard said to his team at halftime inspiried them to start the second half on a 6-0 run to narrow the Red Storm lead to 4. 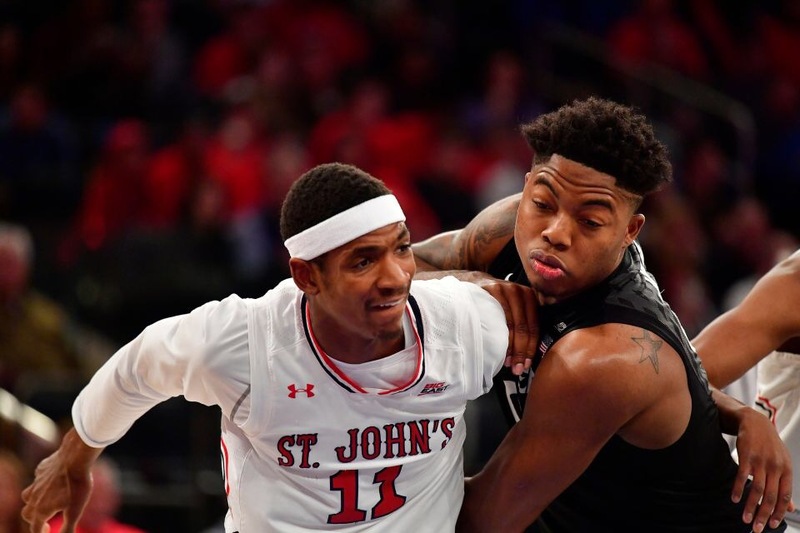 St. John’s responded with a run of their own as Ponds sliced and diced his way through the Seton Hall defense. St. John’s took a 50-37 lead as the game started to slip away from the Pirates grasp. Seton Hall sharpshooter Myles Powell went on a scoring spurt late in the game to bring them within 8 but it wasn’t enough. The final horn sounded and a roar erupted as the Red Storm won, 78-70. Lovett led all scorers with 19 points. Ponds had 17 while Owens had a double-double with 10 points and 12 rebounds. Delgado had his sixth straight double-double with 13 points and 10 rebounds. Rodriguez led all Pirates scorers with 17 points. Today’s St. John’s win and Marquette’s lost to Georgetown propeled the Red Storm into fifth place in the Big East. It’s a tough home slate coming up for Seton Hall who faces Creighton on Wednesday followed by #2 Villanova and finally Xavier. The Pirates slim NCAA Tournament chances rest on winning 2 out of those 3 games. More to follow including quotes from players, Willard and Mullin.